From Goodreads ~ Cats aren't a typical choice for animal-assisted psychotherapy but Timmy and Marnia are anything but typical. Research has found that petting a cat can lower blood pressure and a cat's purr is thought to help heal body tissues and bones. But not just any cat can be a therapy cat, after all, such animals need to be friendly with strangers and willing to be touched, petted and held by unfamiliar people. 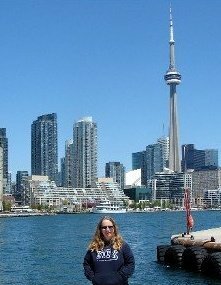 They have to be tolerant of loud voices and angry shouting, emotional distress, and sudden movements. It's a tall order for any animal, but a particular challenge for a cat. In "Purr Therapy", psychotherapist and cat lover Dr. Kathy McCoy shows how two very special cats rose to this challenge, how they helped wounded souls to heal and how they taught even her lessons in mindfulness, joyful living, and compassion. She also shows readers how animal-assisted psychotherapy works and gives them an intimate and moving inside look at how Timmy and Marina worked with patients, how their double role as animal companions and co-therapists changed lives, and how, after their untimely deaths, the grief shared by those who knew and loved them led to even more growth and healing. I love reading stories about animals. 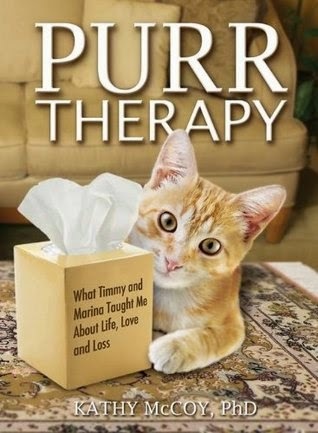 This book is about therapist, Kathy McCoy, and her two cats, Timmy and Marina, who found their calling as therapy cats. Kathy and her husband had always had cats. When the book begins, they have an elderly cat named Freddie who eventually passes away. They can't resist adopting two kittens, Gus and Timmy. Because of his personality, Timmy makes an excellent therapy cat. Unfortunately Timmy dies during the pet food scandal in the late 2000s. They adopt Maggie to keep Gus company and then adopt Marina, who also becomes a therapy cat. Alas, they discover that Marina has feline leukemia and she passes away too soon. The book recounts experiences of the author's patients and how Timmy and Marina had helped them. I liked the writing style and found it to be an interesting read. Yes, it's sad because cats die but it's uplifting to read how they'd helped the author's patients. It's obvious that the author and her husband love cats.